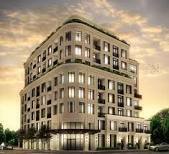 In the very exclusive neighborhood of Yorkville, 133 Hazelton Ave is a must see if it is luxurious life you are after. 24/ 7 concierge services that will cater to your every whim, here at 133 Hazelton Condos, impeccable service is of the utmost importance. Residents will also enjoy the fitness centre with state of the art machines and equipment, yoga and pilates room all while basking in the natural light provided by the floor to ceiling glass windows. Some other amenities at 133 Hazelton Condos are the guest suites, screening room, event room and the lounge.